• Urine screening for the detection of Pregabalin (Lyrica®) use. This strip is made for the detection in human urine of Pregabalin. Pregabalin is the active ingredient of Lyrica®, a medicine used to treat neuropathic pain, epilepsy or generalized anxiety disorders. Pregabalin can lead to an addiction, so it is important to be able to check after the end of treatment that all Lyrica® consumption has stopped. Also used in a recreational way, it may be necessary to screen for pregabalin as any other drug would be tested, which is the purpose of this urine test. The pregabalin detection time in urine is 2 to 4 days after the last intake. 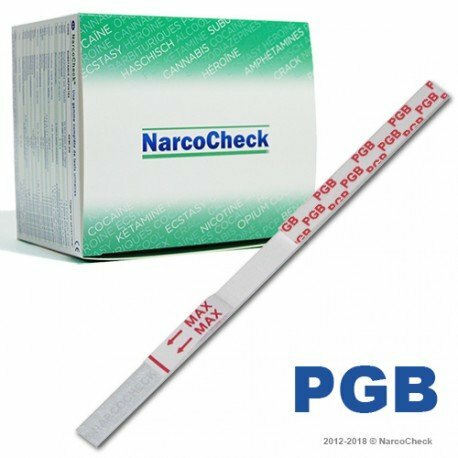 This pregabalin / Lyrica® urine test will be positive if the test sample contains at least 500 nanograms of pregabalin per milliliter of urine. Conversely, it will be negative if the sample contains less or not at all. The test is immersed directly into the urine sample, which prevents any liquid handling. Few microliters of sample are collected using a disposable pipette (provided with each test) and then introduced directly into the test. Available only on special order.